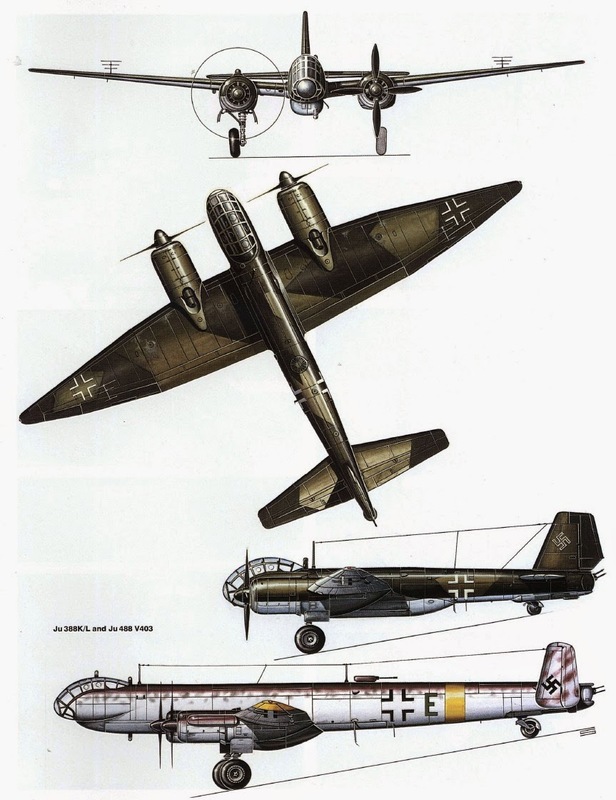 A successor to the Junkers Ju 88 was at an advanced stage of design at the outbreak of World War II, but by late 1942 it had become obvious that the new bomber, the Ju 288, would be late entering service and a stop-gap design was required to bring the series up to date. Junkers had been working as a private venture on an improved Ju 88, and the first interim result of this was the prototype Ju 88B which featured a completely new forward fuselage; 10 pre-production aircraft were built, and these paved the way to the Junkers Ju 188 which featured the new nose; pointed-tip wings with an increase of 6 ft 63/4 in (2.00 m) in span; anew tail unit with the tall, square fin and rudder as used on the Ju 88G; and a streamlined dorsal turret. The first prototype Ju 188 flew in the spring of 1942 with BMW 801MA radial engines, and was followed by the second prototype in January 1943. The performance warranted production orders, but it was stipulated that the design must be such that either BMW 801 or Jumo 213 engines could be fitted without modifications to the airframe, so that if one type of engine became unavailable it would not affect production. Deliveries of Ju 188E-1 aircraft with 1,600 hp (1193 kW) BMW 801ML engines began in February 1943, and 283 had entered service by the end of the year. ATG, Leipzig and Siebel/Halle opened further lines at the beginning of 1944. Designation of the first model with the Jumo 213A-1 was Ju 188A-2, and with water-methanol injection, its engines were boosted from 1,776 hp (1324 kW) to 2,240 hp (1670 kW) for take-off. The Ju 188A-3 was a minor variant, with nose radar and the ability to carry two torpedoes beneath the wing. Two reconnaissance versions followed, the Ju 188D-1 and Ju 188D-2, with crew reduced from four to three, the forward-firing 20 mm cannon deleted and with extra fuel tanks fitted to give a range of 2,110 miles (3395 km). The type of cameras carried depended on mission, and the Ju 188D-2 was equipped with nose radar, being intended mainly for over-sea operations. The Ju 188E variants were for the most part similar to the Ju 188Ds except that they had BMW 801 engines; the Ju 188E-l's 1,600 hp (1193 kW) engines soon gave way to uprated 1,700 hp (1268 kW) BMW 8OlDs, while the Ju 188E-2 was the BMW-powered equivalent of the Ju 188A-3 torpedo-bomber. 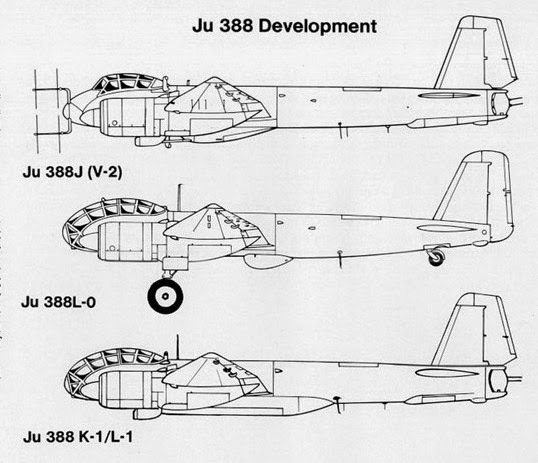 Similar reconnaissance equivalents were the Ju 188F-1 and Ju 188F-2 (Ju 188D-1 and Ju I88D-2). The Ju 188G and Ju 18SH models with manned rear turrets did not reach flight-test stage, but three Ju 188R night-fighters were built in 1944. The variant did not go into production, however, since it was unable to offer much improvement over the Ju 88G. High-altitude models proposed originally as the Ju 188J (fighter), Ju 188K (bomber) and Ju 188L (reconnaissance) went ahead, but the types were later redesignated Ju 388J, Ju 388K and Ju 388L. Simpler versions of these (for high-altitude intruder and reconnaissance work, with no defensive armament) became the Ju 188S and Ju 188T. With Jumo 213E-1 engines with water-methanol injection giving 2,168 hp (1617 Kw) at take-off and 1,690 hp (1260 kW) at 31,400 ft (9570 m), the Ju 188T could reach 435 mph (700 km/h) at 37,730 ft (11500 m). 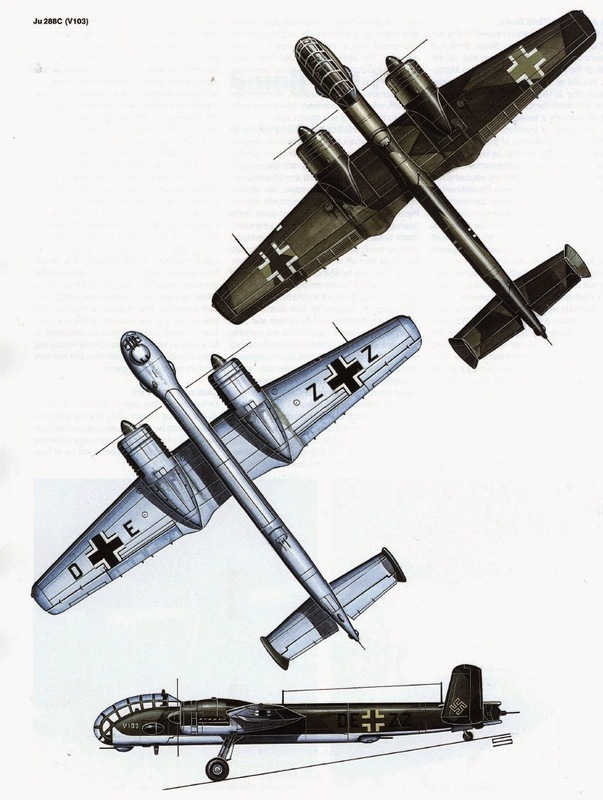 Operating at this altitude, the Ju 188S could carry only 1,764 lb (800 kg) of bombs. Total production of all Ju 188 variants reached 1,076, of which more than half were reconnaissance variants. Probably the most unusual operator was France's Aeronavale, which ordered 12 Ju 188Es just after the war. These were built at Toulouse by SNCASE, from German components, and were used for test purposes. The failure of the Junkers Ju 288 series and the programmes cancellation in mid-1943 spawned yet another variant of the ubiquitous Ju 88 airframe. The Ju 288 had been Junkers' response to a specification issued in July 1939 for a pressurised bomber of advanced design with a maximum speed in excess of 400 mph (645 km/h) and an ability to carry 1,102 lbs (500 kg) of bombs over 3,355 miles (5400 km). Apart from a forward fuselage similar to that of the Ju 188, the new aircraft bore no resemblance to its predecessors, and had twin fins and rudders. The whole story of the Ju 288 was one of technical problems on the one hand and continual requests for redesign on the other. As an example, the original wing span was to have been 51 ft 6 in (15.70 m), yet the final variant had been stretched to 74 ft 4 in (22.65 m) 1 A total of 22 prototypes of various versions was flown, of which 17 crashed during flight test, but the reasons for final cancellation of the programme were shortages of raw materials and a reluctance to affect other production programmes by initiating a new one at a critical time in the war. Against this unfortunate background, it was extremely urgent to fill the gap left by the abandoned Ju 288. Fortunately, Junkers had carried on development of high-altitude models of the Ju 188 and three of these, originally designated Ju 188J, Ju 188K and Ju 188L, became the Ju 388J (all-weather fighter), Ju 388K (bomber) and Ju 388L (photo-reconnaissance) models. Although all were intended originally to have Jumo 213E engines, supplies of these were unreliable since they were in great demand, and the three models thus used the turbo-supercharged BMW 801TJ radial. Since high-altitude reconnaissance was the biggest priority, the first prototype of the new series was a Ju 388L, converted from a Ju 188T, while the following pre-production batch was converted from Ju 88S airframes, the first of them being handed over to the Luftwaffe in August 1944. Construction of Ju 388Ls totalled 47 by the time production was halted in December 1944 when photo-reconnaissance aircraft were, it was decided, no longer a priority. The Ju 388J fighter was even less fortunate, only three prototypes being completed, and 10 pre-production Ju 388K-0 bombers plus five Ju 388K-1 production models had been completed before the axe fell on this, the final development of the Ju 88.